Tagaytay City, the nearest and most accessible weekend get-away from Metro Manila, is one of the most loved tourist spots in the Philippines. Located in the province of Cavite, it hosts a number of scenic spots, delectable food places and fun activities suited for couples, families, barkada, and even the solitary traveler. Located a couple of hours away from the bustle of the metro, it provides a cool and breezy vacation place to soothe frayed nerves and bestow a renewed sense of vitality to city-worn souls. Much has been written about Tagaytay, but for those new in the city, a travel guide and a sample itinerary is an invaluable resource for a trip at one of the coolest places this side of the Philippines. Tagaytay City is located fifty-five kilometers south of Metro Manila. It is easily accessible by air-conditioned public transportations via buses and vans from city terminals around Metro Manila. Driving to Tagaytay City by car is also a breeze. Besides the San Agustin EDSA Rotunda terminal and the Nasugbu Terminal in Buendia, there are three other main public bus terminals in Metro Manila where you can catch a ride to Tagaytay. The first one, which has been closed previously, is the Park & Ride in Lawton, Manila [GPS MAP]. The second one is at the South West Integrated Provincial Transport Terminal in Uniwide Coastal Mall, Pasay City, this is a temporary terminal and would soon be closed by MMDA as they slowly transfer the service to the third place you can get a ride to Tagaytay, HK Sun Plaza [GPS MAP], which is also in Pasay City. Taking a van or FX is another alternative in going to Tagaytay. Although it is much more expensive than a bus, travel time is faster since it goes through SLEX and bypasses the traffic-ridden roads of Cavite. Its terminals are located at the EGI Mall near the LRT Gil Puyat Station [GPS MAP] (Taft Avenue cor. Buendia, 6:00am to 8:00pm), StarMall Mandaluyong [GPS MAP] (EDSA cor. Shaw Blvd. ), Metropoint Mall at Edsa Rotunda [GPS MAP] and at the back of McDonald’s at the Edsa-Taft MRT Station [GPS MAP]. Driving to Tagaytay City via private car is easy enough. Drive through SLEX and take the Sta. Rosa Exit. From there, it’s a straight drive to Tagaytay City. As you arrive at the Olivarez Rotunda, turn right to go to the restaurants in Magallanes Square and turn left if you want to visit People’s Park and Picnic Grove. The main mode of transportation in Tagaytay is the jeepney. Minimum fare is at PHP8.00 but tourist stops are quite a distance away from each other. Ask the driver how much the fare is to your destination. There are also tricycles available but they’re mostly relegated to the side streets that connect to the Tagaytay-Nasugbu Highway. There are no taxis, Uber or Grab in Tagaytay City. Tagaytay City is replete with numerous high-end hotels and inns that can accommodate the A, B, and C crowds. They have huge five-star and boutique hotels for those with deep pockets, they have beautiful bed and breakfasts for mid-level tourists, and inns and hostels for thrifty backpackers. Below are some of the places me and my friends have actually stayed on at Tagaytay. Tagaytay tourists wouldn’t run out of places to eat while in the city, their main specialty being bulalo. A hot bowl fits the area’s cool weather quite well. If you want to avoid the cholesterol levels of this dish however, the place is also replete with all sorts of restaurants serving all kinds of cuisines, be it Filipino, American, Chinese, etc. For those on a budget, carinderia stalls, gotohan and eateries also abound along the city’s Nasugbu-Tagaytay Highway. Tagaytay City and its surrounding towns offer a lot of fun activities and places to visit for the weekend tourists. There are picnic grounds, tree-covered parks, hidden gardens, biking, horse-riding grounds and a host of other activities fit for both the young and the old. Tagaytay City is known for two things, affordable beef meat and buko pies. But dig some more and you’d find other noteworthy pasalubong from this misty city like honey bee products, tarts, jams, pinipig, knives made from its neighboring province of Batangas, and the usual keychains and souvenir shirts. A day tour is enough to cover most of the tourist attractions in Tagaytay City but extending overnight is definitely better, as you get to experience the night life at the restaurants along the Magallanes area. Nothing beats having coffee or beer in the evening with Tagaytay’s cool weather and the lights of the Taal as your backdrop. Tourists also have the option of visiting the Taal Volcano, which is accessible via the town of Talisay in Batangas. For this Tagaytay itinerary, the majority of the second day’s expenses are from the Taal Volcano tour. It is a bit expensive, so it’s really up to you if you want to proceed with it or simply stay at Tagaytay itself, have a food trip and enjoy its cool weather—which is infinitely cheaper. Galeng. What every travel guide blog post should be. I love this share... been looking a good and perfect Tagaytay itinerary. It's more fun in our province - Cavite! Nice post about Tagaytay! I'll definitely go back and try some places there. I've only went recently to Antonio's and Puzzle Mansion in Tagaytay. Maybe you could try them too. Thank you for the post! You've put a strikethrough on the van transpo. Is it no longer available? I heard there were vans from the LRT Gil Puyat station at the EGI building. Thanks! This is very helpful. No problem Angelo, enjoy Tagaytay! I will definitely try your itinerary. :-) Thanks for this! I will definitely try this itinerary. . Thanks for this! Thank you for that info, much appreciated! at what hotel can we stay for 1day/night.. affordable package and location..any suggestions..for two person thankyou..
hi would just like to ask if you know until what time yung mga van? planning to go there in the evening sana after office. thanks! went to tagaytay used this post as a guide. super helpful. thanks for posting it. Ask ko lang kung magkano estimate na gastos if susundin ko yung day trip itinerary mo? I already planned using this as a guide, all that's left is to estimate the cost. Hi. Can we roam the whole place by bringing our own car? lalo yung map.. hinahanap ko ko talaga yang ganyan to see kung ano yung magkakalapit na lugar. tanong ko lang po, plan ko kase is from manila around 8am 1st stop would be sa pink sisters then lunch na sa sonya's garden.. e malayo pala sonya's garden from pink sisters... kaya ba na mag sky eye muna from pink sisters before lunch sa sonya's? Andito lahat ng hinahanap ko ah. Ang galing! Feeling ko, kulang kulang 3k siguro if ever kung susundin ko yung itinerary or less if yung buong maghapon lang. Thanks for this! Nag ka idea ako where to celebrate yung birthday namin ng Hubby ko. We share the same birth date kc. Hehe! Very helpful post! Complete with links pa, thank you! Nope po. Magcocommute lang po, we'll be staying in cavite, near starfish po. We can prepare our packed lunch na po. I see. Sorry have to ask that earlier coz I wasn't able to see the map, my bad. But thanks for the info. nice tips and guide..sana ganto lahat ng adventure guides..thanks po..
Hi! My mom and I we're planning to spend christmas in tagaytay. I already booked for 2 nights in viewpark hotel. Can you help us in our itinerary please?? This are the places we wanted to visit sana kaya lang im not sure if magkakalapit sila. ok po ba magpunta ng tagaytay ng december? hindi po ba maulan? How much should be my budget if i am planning to visit tagaytay for the whole day? 3-4k? Will it be enough to enjoy what tagaytay offers? Hello Christian! 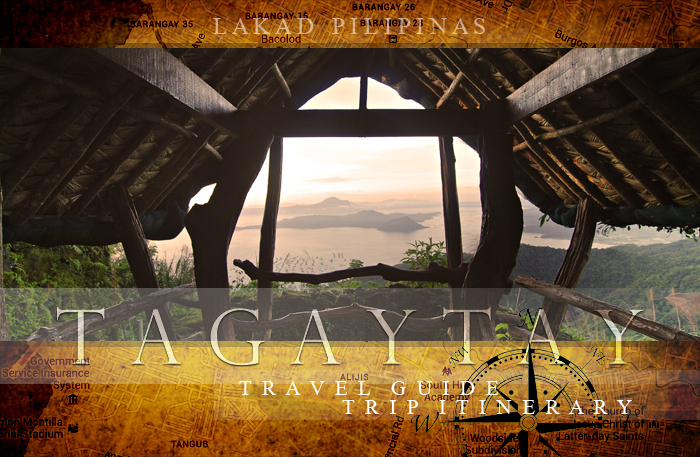 Thanks for sharing this travel-guide, you are a big help to those who planned to visit Tagaytay. Cheers! am planning to take a van to tagaytay on a friday afternoon. saw in your article that the info about vans in egi jollibee in LRT taft corner buendia was slashed out. Hi Christian! Would like to ask on the time of van's departure in Starmall Mandaluyong. Hi Ralph, sorry for the late reply. I haven't really visited Tagaytay City on a Valentine's Day but I think it would be best if you reserve beforehand. How was your experience by the way? Thanks po for the info! May i ask po kung existing pa din po yung mga van terminals? Thanks to this page very helpfull. google map at gps lng ang aming gabay para ndi maligaw haha, day2 na ngayon picnic grove etc last na p2ntahan, syempre pasalubong. Salamat!!! Thanks for this, very helpful.. You may also include this tagaytay Hotel - Summit Ridge. meron po bang buses sa coastal mall to tagaytay nang 7am? Hi, I'm not really sure what's the earliest time the buses for Tagaytay leave from Coastal Mall. Just to be sure, you might want to head over to Edsa Rotunda below MRT Taft, where they start at 4am. They usually drop Tagaytay tourists at Magallanes Square (in front of the Tagaytay Ridge where Starbucks is located). Hi! pupunta ako Tagaytay Country Homes 1 next week, di ako pamilyar sa tagaytay, anong malapit na pasyalan around that area ang pwede kong puntahan? di kasi ako pamilyar sa address? hello po christian.. salamat dito sa post mo nag babalak kasi ako na pumunta nang tagaytay at itatanong ko sana kung kaya ba nang commute lang mismo kapag nasa tagaytay na??? wala kasi akong sasakyan.. anniversary celeb lang sana namin nang gf ko po.. totoo ba na may mga jeep duon? kasi sabi sakin wala.. tapos estimated na magkano kaya ang budget per head sa itngin mo po?? para makalibot nang maganda.. Yes, there are jeepneys in the area that can take you from one Tagaytay tourist spot to the next, just ask the driver before boarding if he's gonna pass where you're going to be sure. Please tell me is it a good enough place to stay there with my girlfriend for 3 days.? Astig to paps. kompleto rekados na aa. sana mdmi k pang mapost na ganto. Happy New year.. Astig na site to! I would like to know the bus time to travel back to manila from tagaytay. We plan to go back around evening time. Thank you. There are buses from Tagaytay to Manila until around 9:00 PM or so. It does get harder to get one, the later it gets. I am an Indian.I am planing a day tour to Tagatay. Leave Manila by early morning say 7 AM an then come back from Tagatay at evening 5 PM. Just wanted to visit People's park.. I have a 2 yrs old kid. Is the Bus good for us? Is the duration good? Wow! Very precise and complete. 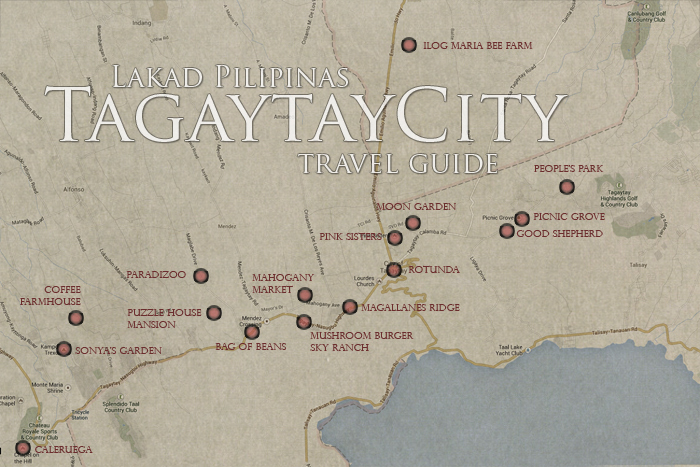 We are about to go there in tagaytay tomorrow and your blog really helps. Kudos! hi, i am just wondering.. in your opinion, how much is will it take for a two day trip to tagaytay in average? Hi! Do you have any idea about the frequency of fx going to tagaytay at starmall? I really hope you can help me prepare itinerary and directions so I would be able to provide an unforgettable experience for my family. Thanks Camille! Enjoy Tagaytay's cool weather! nice po,, wala bang entry for job/s? im looking for work kasi.. thank you,,ang laki ng naitulong nito sa akin. hi Luiszl, you mean work in Tagaytay City? Aside from that po wala na akong maisip na puntahan kasi hindi ko po masyadong kabisado ang tagaytay. Also any advice kung saan pwedeng kumain na magugustuhan ng mga bata yung food and place since may kasama po kaming 2 bata. Hope to see your reply soon.. That would be highly appreciated. Thank you. Hi Justhine, I'm not sure where the terminals are for vans going back to Manila from Tagaytay. My guess is at the Mendez area. My advice, take a bus going back to Manila. Much easier, since you can get one right in front of Starbucks Magallanes, and cheaper. Thanks !ngayon alam ko na mga pupuntahan namin ng boyfriend ko sa tagaytay for our anniversary 😊 saang restaurant pala maganda mag dinner date ? thanks ..
Ah okay , thank you �� maganda ba ang view sa sonya's garden at masarap ba ang mga food ? ☺ thanks po sobra ! Hi christian tnx for posting. Me and my partner has 2 days to enjoy n visit tagaytay to clebrate our 7th anniv. We book a hotel at casa alegria. Does you places to visit and places to eat as listed above is along the way? Pra sna smooth sailin lng byahe nmin balak nmin mgpnta sa bag of beans,sonyas garden, puzzle museum, and to eat at mahogany bulalohan. Most of the places I listed are relatively near Casa Alegria. Are you bringing a car with you? Your hotel is just a bit out of the way since it's not on the main road. If you have a car, then that wouldn't really be a problem. If you're commuting, you just have to make a bit of an effort. I'm pretty sure there are tricycles that can bring you to the main road where you can catch a jeepneey to get to the tourist spots in Tagaytay. Yes sir we have car. So maybe mas convinient kung gusto namin lumabas for an outside trip? Like food trip or other tagytay attractions. Hi! This is just perdere for a 2 day getaway! Would you know Of any car rentals with driver abd how much it would cost on a daily basis, say 10-12hours per day? Is it okay to share the cost of hiking the taal volcano? Because I really want to climb this coming July 29 or 3, 2017, but I don't have any person with. I am Donnielyn Gamutan, really needs your help. 1. May jeep po ba papuntang skyranch from picnic grove? thank you po more powers po! Yes, there are jeepneys feom Skyranch to Picnic Grove. From Skyranch take an Olivarez jeep, then at the terminal, ride a People's Park jeep. For restaurants near Picnic Grove, I highly recommend Cafe Voi La. Hi, I'm Lester. Thank you for this wonderful blog! I guess this will be my guide this coming weekend. I know it's too much but May I ask for the directions on how to go to people's park from Picnic Groove, To mahogany market from People's Park, To Skyranch from Mahogany Market, and Last, to Starbucks Tagaytay downhill from Skyranch. Thank you so mucccch!! Pano po kaya ang way pag nakamotor? good blog...very useful....alang taxi at grab dun ryt? Hi, good day, i would like to ask how to go back to manila from tagaytay or twinlake? Hi! Will be going to Tagaytay from Cubao! May I know ano yung mga signage ng buses na pwede ko sakyan to get there? Thank you! Hi there, look for buses with Nasugbu signage, but I don't think there are buses going to Tagaytay from Cubao. Hello po, ask ko lang pano pumunta sa hotel namin (asian villagr tagaytay) from manila via public transpo.